Two years ago, I started posting our meal plans for the week every Monday morning — I cleverly called the series “Menu Plan Mondays”. The posts were pretty easy to write and I usually got a decent amount of positive feedback — but then I realized that since we eat really simple foods and we eat the same things on a regular basis, me sharing the same recipes over and over again would probably get old. FAST. But ever since then, I’ve gotten a fair number of emails from people asking me to resurrect my Menu Plan Mondays or share a bit more about what meals we eat on a weekly basis. I’ve been thinking about this for a bit, and I’m still not sure what I want to do long-term. However, today, I’m sharing little more about what types of VERY SIMPLE meals we eat — mainly because I think it might be nice for you to see just how simple our meals are, and maybe feel a little less overwhelmed by all the blogs out there who are supposedly making gourmet meals for their families every night of the week. Before we get too far into this post, I should mention that I am most definitely NOT a ‘foodie’ and my goal in writing this post is not to say you should or should not eat the same foods that we eat. I’m also not looking for advice for how we should change the way we eat — I’m simply sharing how we DO eat. I freely admit that I don’t buy all organic or natural foods. We eat some processed foods — but we also eat lots of fruits and veggies. I make a lot of things from scratch, some things from a box, and a good amount are “semi-homemade”. We eat lots of dessert! We are not picky eaters (at least not Dave and I) and we don’t have any food allergies or sensitivities that we know of — which obviously makes cooking a lot easier around our house. And also, when I say our “normal” meal plan — I mean “relatively normal” because there really is no completely normal week in our house. Our schedules change at the last minute, we get invited for dinner by friends or family, we have unexpected company, we have a free babysitting offer and use it to have an adult conversation over Culver’s burgers and fries, etc. etc. Although I do draft up a simple weekly meal plan pretty much every week, I don’t get too bent out of shape if we end up rearranging meals, skipping meals, or saving them for the next week. With that said, here is what our “normal” weekly meal plans often look like. Pop-Tarts — this is all Dave as I detest these things! Here’s a link to all my breakfast recipes. Here’s a link to all my bread/muffin recipes. We almost always have dinner leftovers from the night before for lunch the following day. Dave has a microwave right in his classroom (and I don’t particularly love sandwiches) so this is actually the simplest option for us. We usually prepare our lunches (on a plate for me or in Tupperware for Dave) as we’re cleaning up dinner, which saves time too. 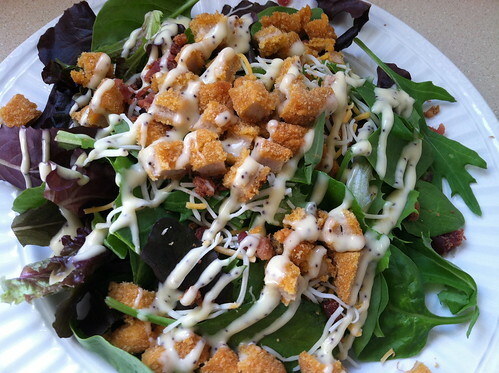 If we don’t have leftovers, Dave will usually make a sandwich and Nora and I will often have macaroni, spaghetti, soup, grilled cheese, chicken nuggets (I’ll put mine on a salad), fruit, raw veggies, or something else VERY simple. I’ve already shared my Themed Weekly Menu Planning “rule of thumb” where I try to plan meals based around certain food themes (a.k.a. breakfast, Mexican, Italian, etc.) and I’m happy to say that over 2 years later, this method is still working really well for me. Chicken Pot Pie — a little bit more involved but SO worth the extra effort! 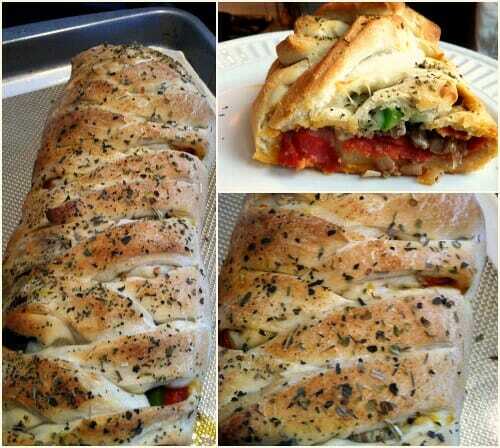 Stromboli — we love this! 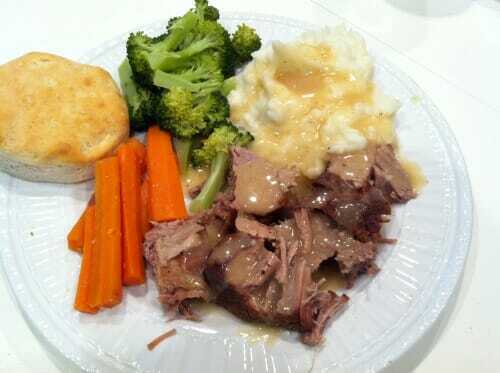 Roasts or other large cuts of meat in the slow cooker or in the oven — I realize this might sound complicated, but you can literally just shove it in the oven or slow cooker and not think about it again for hours. Sunday nights is almost always frozen pizza and salad at our house. Also, whenever I cook, I try to make double or triple batches and put some in the freezer for later. This means that I usually only have to cook 2-3 times per week! 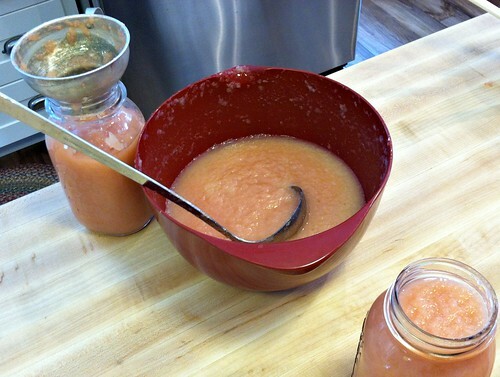 Dave and I both like variety of foods at each meal so we’ll often have 3 or 4 side dishes at dinner — but since at least one of them is applesauce that I always have on hand, and another one is usually some type of bread that I also already have on hand, this really only involves making some type of potato and vegetable — not too bad. I don’t like spending money going out to eat — but I do enjoy a night away from the kitchen. So we’ll often go out to eat (usually something like Culver’s or Arby’s with coupons) once every other week, and we’ll also often have some type of meal with extended family once every other week. This seems to be a pretty good balance for us right now — especially since Nora is young enough to just share some of our food or we bring along a few snacks for her. Oh, and one more thing I wanted to mention — when I was pregnant with Nora, I didn’t get nauseous at all (seriously) but with this 2nd baby, I felt pretty gross from the middle of July – early September. I could EAT most foods just fine, I just couldn’t smell them cooking. So over the summer, we pretty much plowed through any saved up restaurant gift cards and coupons. I totally realize there are different seasons of life, and if you’re in a season of super busy schedules and eating out more than normal — just know that you’re not ruining your family and you’ll probably hop back on the meal-planning wagon eventually! Told you we ate simply! I think by keeping my regular routine SO simple, I’m able to get a mostly homemade dinner on the table almost every night without being constantly tempted by fast food or purchasing really expensive frozen meals. 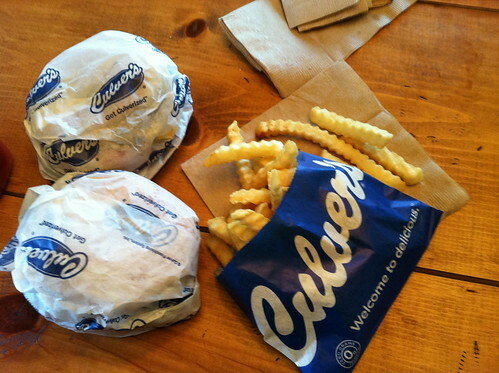 So as you can see, we’re not doing much gourmet cooking over here — but no one is complaining either. 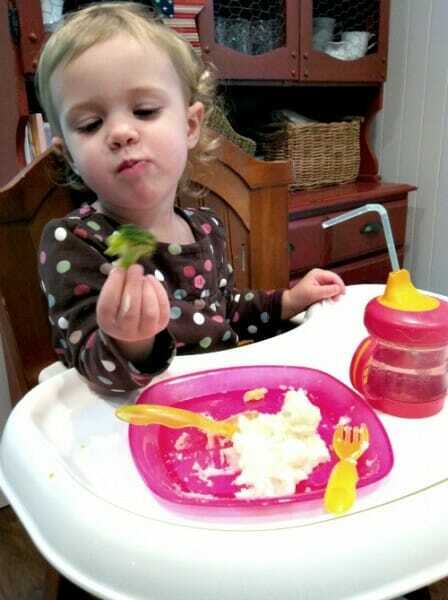 In fact, since I make super simple meals, Nora has been able to try and enjoy many of our foods right along with us (even with her eating / sensory issues). This obviously makes things a lot easier for me too since I don’t need to make something separate for her to eat. So like I mentioned above, this post might just be a one-time thing, I might start posting sporadically about different simple meals we’re eating, or I might turn it into a weekly series — we’ll just have to wait and see! 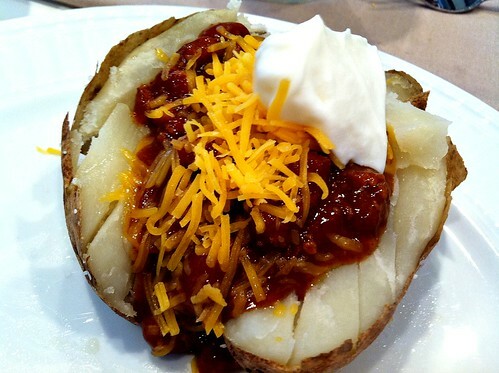 One thing is for sure, I’ll keep posting simple, family-friendly recipes on a regular basis! 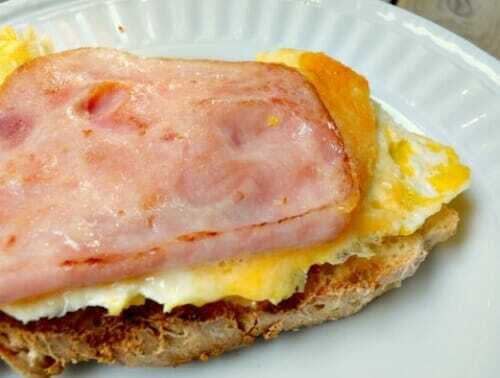 I’ve never actually thought about replacing bacon and eggs with ham and eggs. Have you noticed too much of a difference in terms of enjoyment? Andrea, I love these posts! The more you can do the better is my vote! I love your approach. You’re right about other bloggers who seem to be serving full blown Sunday dinners every night during the week. That just isn’t the way life rolls for us! So to see your simple– yet delicious– approach inspires me greatly. Thanks! Andrea, thank you so much for this post! I don’t know why it’s not common sense to me to not worry so much about meal planning, especially when I know how busy my family and I are, but I continually beat myself up about it. You really nailed it when you mentioned reading blogs that feature all these gourmet meals that seem to be made every night of the week! Even when I was a full time stay at home mom, it was hard to find the time for meal planning and cooking! I always found myself thinking how could they find the time and I can’t! And no it was not because I was sitting around reading too many blogs with fancy recipes all day! 😉 After reading this post, it’s nice to know that I am “normal”, and perhaps I can stop obsessing over things so much! First of all you guys are absolutely adorable! My husband and I are foodies and our weekly meal plan looks just like yours. 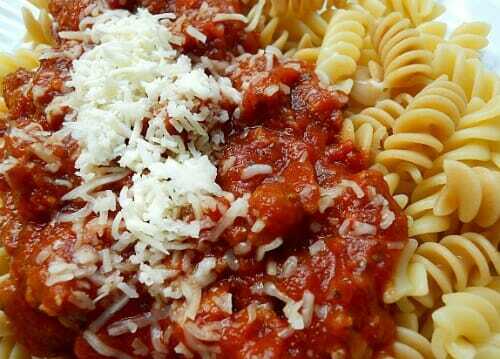 We have a breakfast for dinner night, pasta night, mexican night, and soup and sandwich night. Saturday night is our family movie night and when we like to try new recipes. I can’t wait to try some of yours! 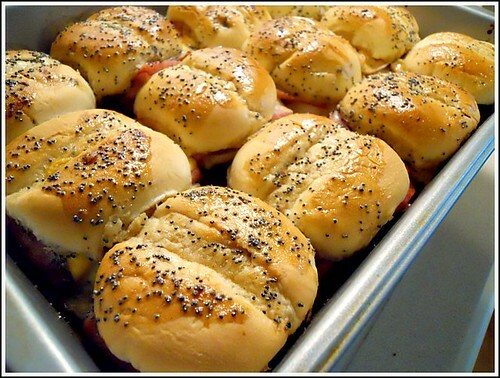 The baked sandwiches sound so tasty; this would be a great one for brunch with friends. 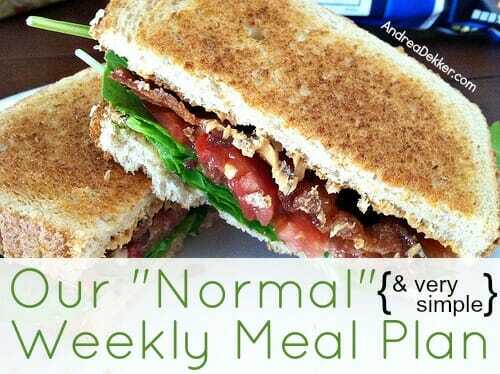 It’s very refreshing to read a ‘normal’ meal plan and also to read the positive comments. Great blog! Thank you so much for keeping it real. I do love cooking – but with a 9 month old crawling all around these days- it’s not always in the cards. So, we’ve been doing a lot of more ‘simple’ dinners. Even though it’s simple – does ANYTHING beat a BLT with avocado in the summer? I think I may have had one every other night for dinner. I would like to thank you for being “normal” (whatever that means these days!! I am sick of feeling like I need to achieve a life that is not realistic anymore!! You are great and I really appreciate your down to earth approach to everything!! Andrea, as usual your “real” approach to cooking (and everything else) is a breath of fresh air – you make stuff seem “doable” rather than more stress-filled. I love your blog!!!! Ever since I ran into your blog over a year ago you have been inspiring me to simplify my life in many ways and I can’t thank you enough for that! I used to try to make fancier food, and sometimes I still do, but I give myself a lot more slack these days when I need it and don’t sweat it too much if I happen to have put hamburger helper on the table for dinner because there were too many other things going on. I like to try new recipes but I cook pretty simply most of the time. I haven’t tried the baked sandwiches yet but I really want to. They look sooooo yummy! I had the “food cooking” nausea when I was pregnant too. No other type of sickness at all, but the smell of meat cooking in particular made me so sick! It was definitely better than morning sickness because I could avoid it for the most part until it went away. You are my go-to for new recipes. No need for allrecipes.com anymore. We’re having the sausage/tortellini soup tonight. Can’t wait to try it. Also, I baked your simple bundt cake recipe this weekend. It is safe to say I will NEVER use a boxed cake for a normal 9×13 cake ever again. A simple white cake mix with vanilla pudding – I’ve never had anything so moist. No frosting needed! I actually made the chocolate bundt cake this weekend too — it’s Dave’s favorite! And seriously, you will LOVE the Sausage and cheese tortellini soup (it’s my all-time favorite soup at this point). Except I accidentally bought stock instead of broth for the soup. I have no idea if it will make a difference? Half stock, half water just to be safe? I am not a gourmet cooker either, but from time to time I like to try new recipes, if I think we will like them and they are easy. Actually one recipe I’ve seen on your cite inspired me to try chowders, since these are not “normal” foods for our style, I never heard of them untill i read it here. We eat soup daily and I am happy that i discover chowders, which are really easy to make and you can squeeze in some not so deisred veggies. I too complain that, when I read cooking blog, there is to much gourmet cooking… I don’t have the money nor the energy or kitchen space to try 5 ours recipes. No way! Thanks for sharing this! I just made your Hash Brown Crusted Quiche this weekend and it was SO good! I had leftovers for lunch today and it tasted as if I just made it. Can’t wait to try more of your recipes! Thank you so much for sharing and I look forward to trying a few recipes you have. I have always felt guilty for not being the “gourmet” mother,but realize I am pretty much doing the same thing your doing and my kids are healthy and happy. Thank you. LOVE your site!!! I thought you said you like desserts and you have them a lot… but no links or info on what kinds of desserts you eat around your house. Fruit drizzled with honey? Cookies & Milk? Pie & Ice Cream? Trifles? Pumpkin rolls? here’s the specific dessert recipe link — however, we’re also big fans of cookies + milk, boxed brownies, or a bowl of ice-cream if I don’t have anything else in the house!! i enjoyed this post as it’s how i cook at home. i love that you didn’t say “low fat” “low carb” or “gluten free’ anywhere in this post. my goal is always to get plenty of veggies in everyone. I realize there are many people who HAVE to eat low fat or gluten free, but I also know there at lots more people who don’t. Sometimes it’s overwhelming for me to see all the new gluten-free, low fat, low carb, dairy-free recipes when I just want something “normal” that’s inexpensive and that our family will love. so true.people with a digestive problem aside, i know that there are trends in eating which may be just a fad. too many people will just not stick with that age-old advice “everything in moderation”. it also costs a lot more to buy all this gluten-free food. i feel that companies are gouging consumers who want to try this style of eating. Here is a favorite that I recently discovered. To simplify I use a pkg. of fajita seasoning instead of mixing up all the spices. Oh I realized the first time too that I forgot to buy the tomatoes so I never added those. 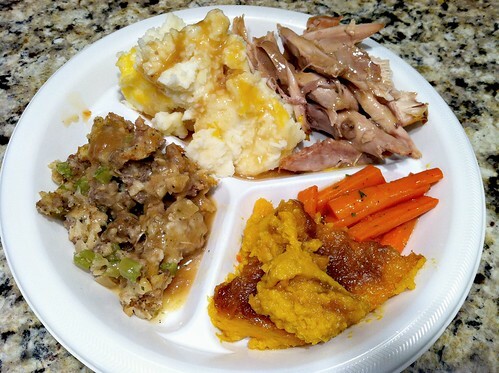 a 9 x 13 casserole or a crockpot meal can last us 2 nights!! Thanks for sharing. This makes me feel more normal, as I eat the same foods often. I love your blog/website.